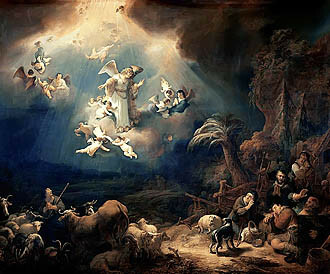 “Annunciation to the Herders” by Govert Flinck, 1639. The shepherd wraps his cloak tighter around him, in the middle of the night shift. Soon it will be time to wake his relief, for his turn to get a little sleep. Suddenly a blinding light envelopes him and with difficulty he can make out the figure of angel. Did he doze off during his watch? Is he dreaming? As his fellows bolt awake, aware of a great disturbance, he realizes this is really happening. They all tremble, not from the cold, but from terror. After the angel reassures them, they hear the greatest news – the long-awaited Messiah is born! And if the awesome appearance of the angel is not enough, the heavenly host now appears to glorify God and celebrate the arrival of this Son of David. When these fantastic creatures disappeared, what was the reaction of the shepherds? Was this news true? They decided to find out, and followed the directions. Bethlehem was a small village so it shouldn’t have been too hard to find a newborn in such an unusual cradle as a feeding trough in a stable. After confirming the birth, they spread the news. The people were amazed. The Bible doesn’t give many details, and I have so many questions. Who was awake at that hour? Why did the villagers believe them? We don’t know how much they knew. Had the star appeared yet? Did anyone see the glow in the sky when the angels appeared in the fields? Did the noise of the angelic celebration awake them? How far did this news spread? Was the incident forgotten later because of their overwhelming sorrow when Herod ordered their children killed? Or did some remember years later, when the itinerant preacher Jesus came on the scene, and go to see Him? Were the shepherds among His followers? God chose a humble stable as the birthplace of His Son, then selected some working class, blue collar workers to be the first to receive the good news about this miraculous birth. The angel said, “I bring you good news of great joy that will be for all the people.” All the people – even shepherds working the night shift. They returned to their work, basking in the glow of the experience – God’s word is true. So they glorified and praised Him, as did the heavenly host before them.